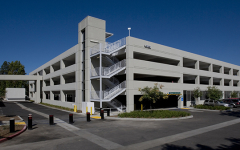 Designed to serve the parking needs of the adjacent office building, the 4002 “Metro” Parking Structure provides 569 parking spaces in the 3 ½-level structure. 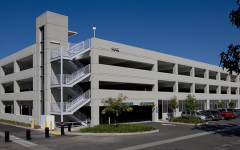 A portion of the garage interior has been segregated to provide secured parking for a federal agency housed in the adjacent office building. The design includes a pedestrian bridge directly connecting this secured parking area to the federal office space within the building. 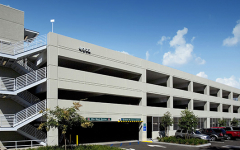 A glass-backed elevator is located at the southwest corner of the floor-plate, clearly identifying the primary pedestrian entry/exit location to the garage. The building exterior was designed in keeping with existing architecture on the site. A clean and simple painted façade with reveals cast into the concrete creates a cohesive consistency with the office building as well as the remainder of the neighboring commercial complex.